The Green Wall are picking up right where they left off in season one. A champion has been crowned at the first major Gears of War tournament of the new season. OpTic Gaming defeated Echo Fox earlier today to win the Gears Pro Circuit Dallas Open. After an early loss in pool play, Nicholas “Icy” Cope, Gilbert “Xplosive” Rojo, Billy “MentaL” Putnam, Alex “SuMuNs” Ascencion, and Justin “Kenny Bounce” Kenny bounced back to capture another championship. OpTic took down Echo Fox 7-4 in the opening map of the grand finals. Echo Fox was then up 5-0 in the second map of this series, but that lead wasn’t safe, as OpTic took seven straight rounds to win the tournament. 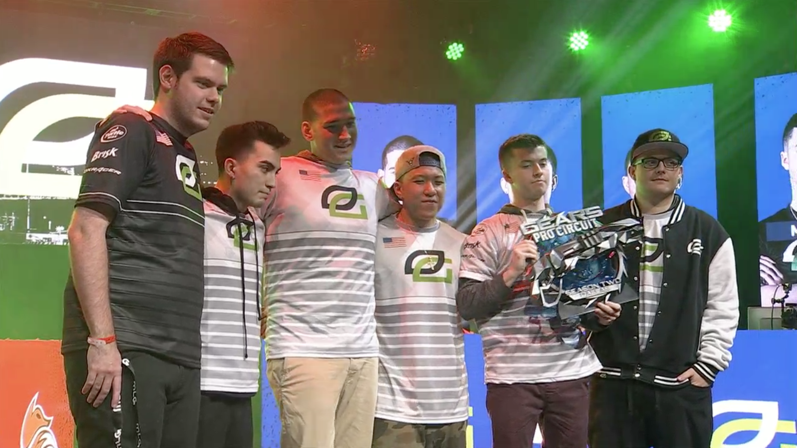 OpTic won the final three events in season one of the Gears Pro Circuit, so many fans weren’t surprised to see this squad back on top this weekend in Dallas. The Green Wall will walk away from the first event of season two in the Gears Pro Circuit with $120,000, while Echo Fox earned $60,000 for their second-place finish. OpTic will look to defend their title at the Gears Pro Circuit Mexico City Open, which is scheduled to take place from Jan. 26 to 28.